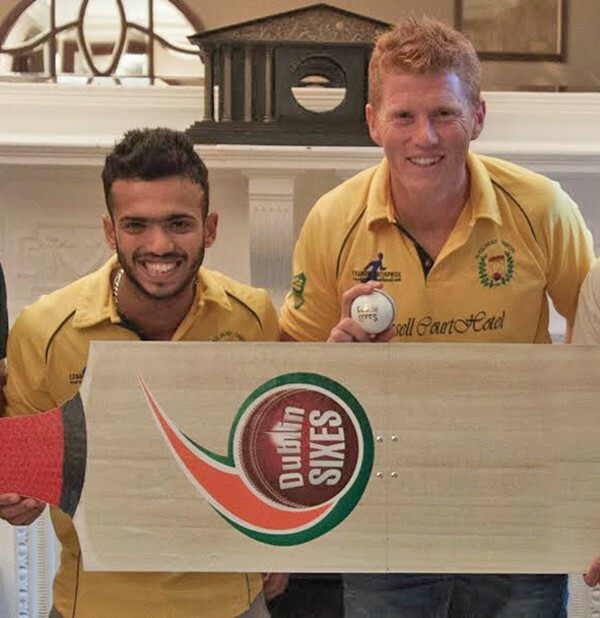 Above: Railway Union’s Kevin O’Brien and Rachit Gaur at the Official Launch of the ‘Dublin Sixes’ held at Russell Court Hotel. Rachit was voted ‘Player of the Season’ at Railway Union for his all round performances. Photo courtesy Arthur Deeney. Railway Union 1st X1 had a strong finish to the Leinster Division 1 League with big wins over Merrion C.C. by 94 runs and Malahide C.C. by 6 wickets in a re-arranged 20 over match. The win over Merrion on September 6th was a big blow to the Ballsbridge side as they were in pole position in the league with just two matches to play. As a result of the two wins, Railway needed just three points from their last match versus local rivals YMCA on September 12th to survive in division 1. This match was ‘washed-out’ by heavy rain and with Cork County unable to arrange their fixture versus Malahide, it meant that Railway Union survived and will play again in Division 1 in 2016. It was a great achievement for such a young and mainly inexperienced team who did not have the addition of a paid overseas player for their league campaign. For many cricketers at Railway Union, this was not the end of the season as they participated in the inaugural ‘Dublin Sixes’ held on September 19th and 20th at Trinity College. Railway’s Kevin O’Brien was one of the leading lights in this new initiative. The week-end featured teams from overseas as well as some big hitters from local cricket. The organisers hope that it will become a major event on the sporting calendar over the coming years. The Club will be holding a ‘Trivia Night’ on October 9th at Railway Union Sports Club, Park Avenue and all ‘not too-serious’ quiz fans in Dublin 4 are cordially invited to join in the fun on the night. Details in the poster.